March 13, 2015: Eugene contacts Zee with information…. Zee's teleport goes wrong and she brings in more people. Metropolis was bad news and the eggheads back at Project Rebirth were staggeringly furious with Corporal Thompson for his misuse of the suit and engaging a Kryptonian level threat. They even went so far as to demand he relinquish the suit to the next candidate. They were rather surprised when he either didn't… or couldn't. They tried several different methods, all failed. Eventually they just placed him under house arrest. It just wasn't their day. Late in the evening, swinging across the skyline and landing upon the lip of a building, Agent Charlie paused for a moment to make sure they hadn't dispatched a set of drones to tack him. The suit's danger-sense was clean, nothing visible. He took a moment to fire up the burner he'd gotten from an acquaintance of his, the clean one that the Project people had no idea about. He sent a simple text message to that gal he met the other day. As quick as that. Chances are she won't show up, which means he'd be hitting the Hydra op-center on his own. Which doesn't make a difference to him. Then again, at the rate he seems to be losing friends, making a few new ones might be good. So it was late when he made it to the park. The black-suited operative found a comfortable perch upon the top of a swing-set in the playground, a nice high point to observe the place from. Not too terribly visible from afar unless someone knew what they were looking for. Why on earth, Zee used the words 'us' in her spell, is beyond her, but as her magic swells around her, it reaches and grabs Pepper as well…. who knows who else it will pull in…. silly Homo Magi should be more mindful of her words! Pepper Potts was glad to hear from Zatanna about Jes, and is walking her out of the office when the magic wielder is not quite precise enough with her spellcasting. Uh, oops. Pepper is caught COMPLETELY off guard by it, so when they appear where ever they appear, she's extrememly disoriented and more than a bit dizzy from the translocation. "What the…"
Well, Lunair was packing away stuff she had bought for Pinchbro's tank. He needs some kickin' rocks, maybe a little tidepool kinda set up. A book entitled: "So you've got crabs!" with the subtitle: Caring for YOUR Crustacean! on the cover sits in the driver's seat of the car as she stuffs the stuff into the back. She was interrupted by an incident earlier, so she had to move her car and repack. There's also a copy of I, Pinch with a crab on the front all about crabs. She's apparently a pretty diligent care taker. There's a small barrel with a few lotuses and lillies. It seems she has some pretty peaceful hobbies when not getting dumpsters flipped on her or poking Winter Soldiers or bothering HYDRA. Or dealing with evil aliens! Or helping X-peeps or - or - well, she's a very diligent kinda gal. 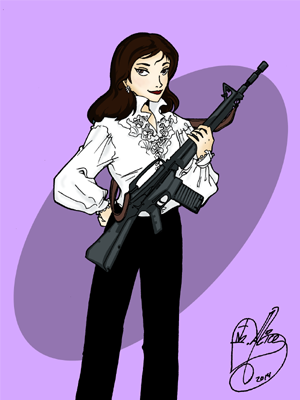 Lunair totes helped save earth from some bad guys and no one could frown at her for shooting something. It was a good day. And then suddenly, a weird feeling like being beamed up is upon her. She blinks owlishly and ends up near the others, books in hand. STARE. Like a cat falling off the TV. The appearance of the trio of women would almost go by unnoticed. A touch distant, nearly silent, as quiet an arrival as any. One moment that patch of earth stands vacant, and the next… there they are. From afar, Flash turns his head to the side, looking at them, gauging. He did see her throwing lightning around the other day, so of course she can teleport. He's seen weirder. As quickly as that it's set aside mentally. Dropping from atop that swing set that has a trio of seats, Agent Charlie makes himself a touch more visible as he moves into the light of the nearby lamppost, lifting a hand to offer greeting. Yet for some reason… there's a subtle tingle in the back of his head. No idea why, but the suit is trying to tell him something. The trio do appear out of seemingly nowhere with a soft 'pop' sound and Zee looks wide eyed at Pepper and Lunair and sighs in recognition. "I have to get better at that… I'm so sorry Miss Potts, it seems that I've bought you along with me again." It takes the raven haired woman a few moments to place Lunair and then she smiles again "Did my poor spell casting catch you too?" As Charlie becomes visible in the street lamp, Zee raises her hand in greeting "Well, I'm here to meet him… about some snakes." If Pepper and Lunair get the reference, all the better. Pepper Potts takes a longish moment to regain her bearings, then looks at Lunair and offers her a slightly wobbly smile hello before turning to see Zee greeting a man that's approaching them calmly enough. She doesn't like this. At all. But that's probably because she's in the middle of a park somewhere she doesn't know where, and both her tablet and her phone and her bag are all back in her office. She is NOT used to being without her personal resources. Lunair seems to be a little bit surprised for a moment. She blinks owlishly. "Actually, it was a pretty potent spell if it was spread out like that?" She seems confused. Headshakeheadshake. She clings to her books for a moment. At the mention of snakes, Lunair's expression clouds. "I bet they have seven heads, huh." There's a dim, dark, seething rage beneath those words. Someone has a hate-on hard enough to power more than one youtube discussion. There's a tipoff that something is off. She doesn't show emotion beyond actively working at it. Her expression is blank, distant. The ole thousand yard stare. She blinks at Agent Charlie. "… I … see. Friend of yours?" She murmurs. Luna's at least got her phone in her pocket and can likely create things she needs. She smiles to Pepper, but it seems to be a conscious motion. But she's trying! Closing the distance, the lone figure before them is clad in black with white eyelets. He's wearing a combat harness, a balaclava, and Lunair almost instantly recognizes the various firearms that are obvious and secreted about his person. It's almost as if an action figure from some 80s cartoon had come to life. Tilting his head to look over the others, the only one he recognizes is Zee so he focuses on her. Holding up a hand he gestures casually towards Lunair and Pepper as if asking silently if they're ok. So long as he doesn't get an objection… he continues. "Met a fellow who was raiding a place. Gathered some intel for a few hot spots that could use a looking into. Didn't know how proactive you and your buddies were." Smiling apologetically to Pepper, Zee responds to Lunair "Known to me, not a friend" yet… who knows what will happen in time. Tilting her head at the spooky, woo, voice coming from the suit, she's only heard it once before and it unnerves her a little, "Intel on some snake pits?" the raven haired woman is learning all sorts new terminology "And yeah, we're proactive, seems to be the right thing to do. Who'd you meet?" It's possible Zee is knows him… or maybe not. Seeing Peppers discomfit, Zee looks distressed "I'm so sorry, Miss Potts, let me send you back… I'll be more careful in future." She tries to be as specific as possible with her spell this time and Pepper Potts winks out in front of them and finds herself safely esconced in her office in Stark Towers. Pepper Potts does indeed find herself back in her office, but the disorientation of two teleports in such short order leaves her asking Cricket to clear her schedule for a hour so she can lie down and stop feeling like the planet's trying to throw her off of its surface. Lunair ohs. "I - wow. I died and went to an 80s action montage." Headtapheadtap. She kind of eyes the lone agent. There's sort of a wariness. She knows fighting, and he is definitely one of them. There's an uneasiness, one predator staking out another. On the OTHER hand, if he's running around like that in NYC… Hn. Well, she carefully returns the hand gesture. Okay! "… wait, really? Not just m—" Pause. "Mmmmmmmy friends…" She goes quiet. Gaga-sensei would be ashamed of her poker face. Her voice is quiet, and there's a sympathetic look as Pepper goes. She's in a little deeper than most, but she's also sorta got more snake problems than Samuel L. Jackson. It may be of note his spooky wu doesn't bug her much. It's more an addition to reasons to be wary. To Zee, she does offer, "It's good to see you again." Folding his arms over his chest, Flash looks after the departing Pepper Potts. When she flickers out of existence again he turns back to Zee and says in that eerie and curiously reverberating tone of his, "That must be terribly useful." His attention shifts over to Lunair for an instant and perhaps assumes that she is 'down with the sickness' and won't run off and tell Hydra what they're about. Then again perhaps he wouldn't care if she did, at least on some level. Attention back on Zee he replies, "Met a tech, went by Aspect." He holds up a hand, "About yea high." There's a pause as he awaits some sign of recognition from her, then continues. "Was apparently raiding their network and got some information. These addresses." At that moment Flash lifts a hand to one of the velcro straps on a breast pocket from his harness. He pulls the strap open and produces a small data pad that he hands towards the Magician for her to peruse. "Haven't checked any out yet. Don't have orders to either, but then again I've sort of lost my enthusiasm for orders. Least for the moment." Shrugging, Zee "Sometimes it's useful" and sometimes it backfires on her too. "Aspect?" Zee smiles a little "Happen to know him. Good guy." Taking the data pad, Zee looks over the addresses and nods as she does. "Thank you. Are you able to send me this information, or do I keep the datapad" She sort of enjoys teasing the people around her. Looking to Lunair, Zee looks apologetic again (she's doing that a lot lately) "I'm not quite sure how to introduce to you…." Flash's comments about loosing enthusiasm for orders get an enquiring look "Why's that?" "I suspect because they've burned him a few times." Comes a rough, low voice. From not too far away and rapidly approaching is a werewolf. 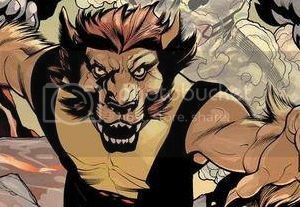 Well, a tall, brown furred man with claws, expressive ears and fangs. So, yeah, a werewolf. "Hello there again. No drones this time, I see." Lunair listens in. She is apparently, in fact, not a fan of Linking parks, but she does seem to be down with it as it were. She looked distant, but now she's certainly more alert. Attentive. And wary. "Wait, Aspect? He's my friend." There's a bit of concern there. Did Aspect have others on the case? Then again, last time: More snipers than a video game. She is surprised. She looks to Zee. "That's okay. I go by Armory when I'm at work," She waves a hand. Then, a - werewolf! Lunair beams. "No drones. I hate the drones." She really does. "Though, they're kinda funny when they crash," She admits. Really funny. "It's good to see you both despite the circumstances. But I suspect you have some sort of deadline. Or if you're serious, they probably aren't going to let you sit out around." Those white eyelets shift in Nicholas' direction and curiously enough some measure of recognition can be seen in the man's stance. He merely just shifts his weight to the other foot, so as to keep all of them in front of him. Flash motions for her to keep the datapad, then he opens his hand towards Zatanna to introduce himself as he says, "Charlie is as good as anything." So he's retained enough professionalism to at least keep it at that. Resting his hands on his hips, the man in black looks over this unlikely cadre of individuals and makes a small 'hnh' noise which sounds rather strange with the alien-like reverberation of his voice. "Is this your doing?" He asks of Zatanna and motions with a shift of his head towards Nicholas. Then he adds, "Last I heard werewolves were sorta mispleased with the whole multi-headed snake thing." "Armory" Zee tests Lunair codename out and nods, committing it to memory "I'll remember that. And yes, it's good to see you again too." The appearance of the werewolf of New York, startles Zee momentarily but she recovers quickly enough. "Oh, hello there…" no names until she's determined how much people know. "I don't have any drones either." purposefully misunderstanding Nicky's question. "Nice to meet you, Charlie" Zee turns her attention to the helmeted figure "Nope, not my doing at all. But we do know each other." Nicholas nods to Zee and Lunair. "Hey there." He says to the other X-Student as he settles about eight feet back, hands in pockets. "You know, not every werewolf is part of some Ur-Pack you know. And I'm just a mutant. This is how I look." And yes he looks wolfy and yes he can act wolfy too but he doesn't particularly have a mystical connection to 'wolf'. Zee and Eugene get a curious gaze. "Is what who's doing now?" Lunair smiles at Nicholas. "Hi there. And it's nice to see you," She adds. She looks to Zee. "Yeah," Lunair is likely being quiet out of respect. She's not sure what's going on, and who knows what. With more than a couple million /already/ being spent on rounding her up (and a Taskmaster in a patridge treeeeeeeee~), she's a little leery these days. There's a quite smile at the drones declaration. Lunair regards Charlie curiusly enough. Huh. Hmmm. Answering Nicholas, Flash's reply is a light, "Tomayto, tomahto." The ins and outs of Werewolf diplomacy are not his forte apparently. He looks back towards Zatanna and points towards the datapad, "I made a pair of lists, figure the first group are ones I can make a passable excuse for running by. The second group maybe you and yours can go take a gander. We meet back here in a week's time and share what we've found." Those two that are discussing this hit on the Hydra bases, they're definitely not being forthcoming with answers. Then again one can never tell who might be listening from afar with a lone-range microphone or even super-hearing. Of course when that thought occurs to him, Flash looks up a bit, as if making sure. That having been said he turns towards Lunair and Nicholas. "You two need a run down, mebbe you can get it from Teller here." Zee tilts her head towards Charlie as she speaks to Nicholas "He wants to know if I organised for you to be here." Either purposefully or by accident, as the case may be. "I think I can look into that second list… and sure, we can meet back here in a week, or you can contact me again." Glancing over to Lunair, Zee gestures with the tablet "We're talking about flushing out snakes nests. Do you want in?" The young magicians first point of call is going to be Jericho, in any case. Lunair is quiet. Uneasy. "Meeting again is fine. People can find me. One of my relatives works for Miss Pepper." That's the extent of the info Lunair seems content to give out for now. She really likes people. She does. But when you're being hunted down like the last good flavored donut in the office, well. But she's agreed and she'll do Lunair stuff. HYDRA. Not the first time Nicholas has heard talk of it. Probably something that'll come up again honestly. Though he hopes it's on the medical end and not the fighty end. He knows how to fight sure. But he's not a superhero. Really. "Ah, I see. No she didn't. I was just passing through." Like the last time he ran into Eugene. Or Lunair for that matter. That… makes Flash suspicious. He looks sidelong at Nicholas and then makes that 'hnh' sound again. There've been weirder things, but still. For a time those white eyelets remain on the young furry fellow, but eventually the man in black turns back towards Zatanna. "Next week then if not sooner." With that said, Flash turns and starts to walk away, his footsteps silent on the sand and grass of the playground as he crosses the way. It's not too much further when he's beyond the light of the street lamp and out of view, leaving the other heroes to look on. Zee watches a Charlie walks away and sighs deeply before looking at Lunair and Nicholas. "Armory, I'm sorry to have dragged you out tonight and thank you for agreeing to help. Let me send you back again." As Lunair pops out of the area, Zee looks to Nicholas. "Care to walk with me a bit?"